no revenue, no bank accounts, and never paid any interest under the loans. The SEC’s complaint include the figures below regarding the alleged Woodbridge scheme. These numbers can be used to illustrate the mathematics behind a Ponzi scheme. 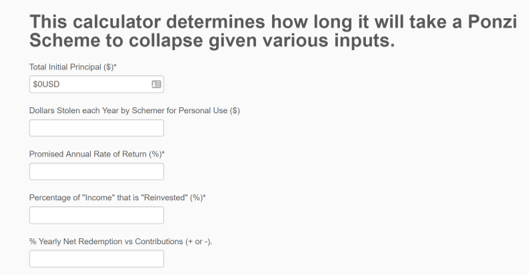 These numbers can be plugged into DSA’s Ponzi Scheme Calculator to determine how quickly a Ponzi scheme will collapse. I combined d, e & f from above and divided by 5 for the number in “Dollar Stolen each Year by Schemer for Personal Use” field. The “Yearly Net Redemption vs Contribution” figure of -4.7% was calculated by dividing (g/b)/a. 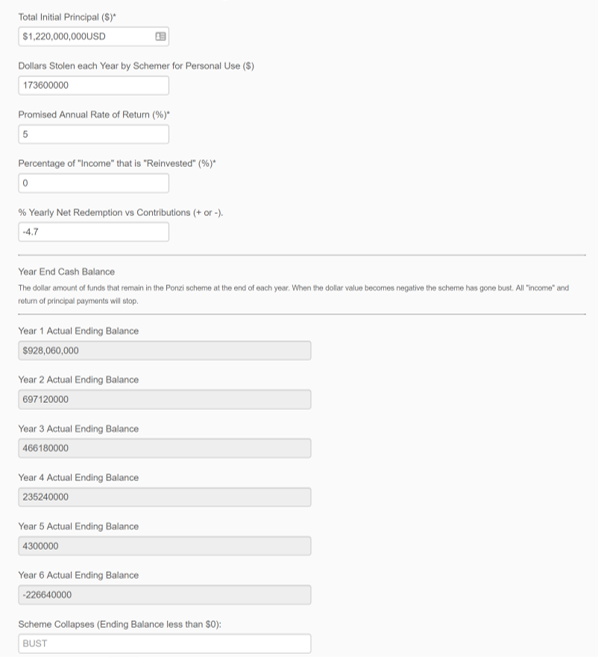 I’m happy to report that DSA’s Ponzi Scheme Calculator determined that the scheme would have collapsed between its 5th and 6th year, just like the alleged Woodbridge scheme did in real life. Ponzi scheme longevity engenders trust, which leads to repeat investment and new investors and a larger pot to steal. Longevity adds to a schemers credibility. –Encourage “reinvestment” of income. The less income the schemer pays out, the longer the scheme will last. -Moderate the amount stolen each year. If he steals a smaller amount each year, the scheme will last longer and he will likely be able to steal more money overall. -Discourage redemptions. Paying out principal to investors at a high rate will crash the scheme quickly. Therefore institute a large penalty for early redemptions or promise an even higher Rate of Return if the principal is reinvested instead of withdrawn. -The Rate of Return promised should be higher than alternatives but not so high that paying out income will quickly bankrupt the scheme. -Recruit new money. New money is key to maintaining a scheme for an extended period. Woodbridge and Shapiro pooled FPCM Investors’ and Fund Investors’ investment funds into Fund Entity bank accounts and then further commingled them into a single Woodbridge or WSF operating account under Shapiro’s control. The commingling was extensive and resulted in transfers totaling approximately $1.66 billion and exceeded 10,700 transactions. If history is our guide, the banks involved should expect to be hearing from regulators, bankruptcy attorneys and attorneys representing investors.